Don't hold your breath for Chipotle milkshakes. Chipotle is testing new menu items like quesadillas, nachos, a new spring salad, a classic Mexican chocolate milkshake and avocado tostadas. But the company hasn't committed to selling those items at all stores. 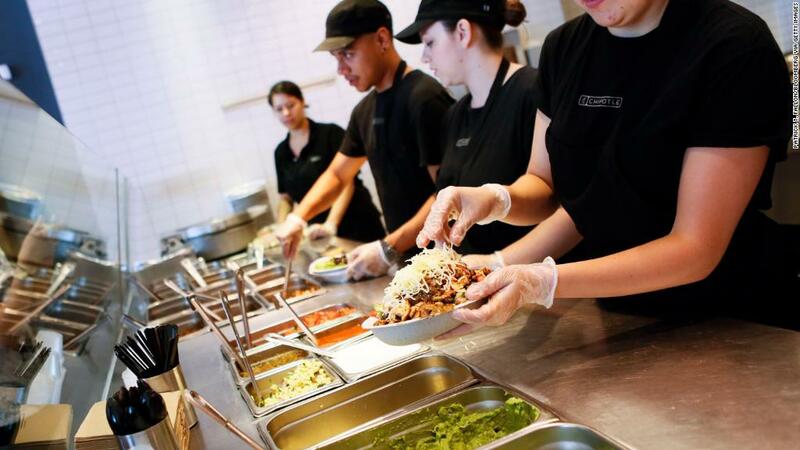 And if Chipotle (CMG) does decide to add them to the national menu, it could take up to three years. "You're somewhere in the 18 to 36 month range getting things from start to finish," CEO Brian Niccol told CNN's Christine Romans on Thursday. He noted that in rare circumstances, it's possible to move more swiftly. The company unveiled the possible new menu items last week. Niccol explained that at this stage, Chipotle is still collecting feedback from its test markets. After a few weeks, his team will have a better sense of how customers are reacting to the new offerings. He did not indicate where the menu items might roll out first. Then "you decide, 'Hey, we've got this thing nailed, let's just figure out how we continue to fuel it, or you say, 'You know what, we missed this one, we gotta start over.'" "When it's ready to go nationally, we'll roll it out nationally," he said. The potential new menu items are part of the fast casual chain's plan to woo people back after a series of health scares during the past few years — most notably an E.coli outbreak in late 2015 that made 60 customers in 14 states sick. "We're going to be always working on winning customers' trust," Niccol said. "We're always working on giving an experience that ultimately customers say, 'Hey, I want to do that again.'" The company has also rolled out new ads and is testing happy hour and late night deals to win back customers. It's also enhancing its delivery options and trying speed up lines so customers get their food quickly. Niccol stressed the importance of making sure that any new menu item doesn't slow the production line. The company's sales have rebounded in the past few quarters and are up about 45% this year. But on Thursday, the company's shares were down about 8.5%. BTIG analyst Peter Saleh wrote in a note on Thursday that Wednesday's investor call "was lighter on detail than we would have liked so we expect weakness in the stock today." We "still believe management is firmly on the right path," Saleh wrote. Wedbush analyst Nick Setyan said that Chipotle's current stock price had expectations of new initiatives built into it. "The current valuation implies a whole lot of good news," he said. "We didn't get a lot of good news" on Wednesday's investor call, he said. And with meals that cost about $13, the company may have hit a price ceiling, he added. Setyan also noted that the happy hour and late night deals could end up pulling customers away from lunch and dinner.